2017 was a big year for 3D printing, from the announcements of new partnerships, to new applications of the technology. With the 2018 already upon us, what new trends in industrial 3D printing will we see over the next 12 months? 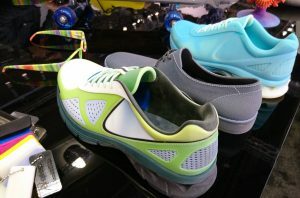 We’ve compiled a list of our predictions for the six trends you can look forward to this year. Recent advances have made 3D printing more cost effective and, as a result, more appealing for companies across a range of industries. No longer regarded as purely a tool for prototyping, 3D printing technology is increasingly being recognised as a viable means of producing end-use parts. This shift can be attributed to a number of factors, such improved hardware capabilities (e.g. greater precision and higher resolution, and the ability to build larger parts) and faster speed times. Consequently, this year we will see even more businesses recognising the value of integrating additive manufacturing into their existing processes. With 3D printing predicted to have a transformative impact on current business models and supply chains in the years to come, 2018 will see more and more businesses leveraging the benefits of faster lead times and production runs that the technology provides. With the increased adoption of 3D printing technology, we will see workflow processes become more streamlined and optimised. Automation at all stages of production (including pre-production and post-processing) has been key to this gradual transition – and will continue to play an important role over the next twelve months. Currently, many companies struggle with efficiency problems and attempting to fully optimise their workflows – using manual and disconnected systems to manage the production processes. However, workflow automation software, such as RP Platform, can be used to integrate with existing systems and automate the entire end-to-end process. Moreover, as industrial 3D printing moves into the realm of production, gone are the days of the standalone 3D printer – now these technologies must be integrated into digital production lines. This transition will open up a wealth of opportunities for automation at every stage of the production process. Customisation has become a buzzword in recent years, as consumers increasingly expect products tailored to their needs, and companies discover the value inproducing bespoke products for specific use cases. With traditional manufacturing, mass customisation is not economically sustainable due the complexity of the parts required as well as the smaller batch sizes and production runs. It is here that 3D printing can fill in the gap – by facilitating the creation of low volume products and parts with a greater complexity than is possible with traditional manufacturing. 3D printing ensures a faster time-to-market thanks to a quicker design cycle, as well as enabling reduced inventory costs through printing on demand. The benefits of customisation have already been embraced by the dental industry, while aerospace and other medical fields are also forerunners in the adoption of 3D printing technology for creating specialised parts. However, these are far from the only applications that can benefit from mass customisation. From custom earbuds to footwear and car parts, 3D printing will help companies deliver a tailored customer experience for both consumer and commercial purposes. Metal 3D printing saw rapid growth in 2017, as advances in metal technologies were made, and the technology became more affordable. Cost has historically been a significant barrier to the wider adoption of metal 3D printing, with a professional metal 3D printer typically costing well into the hundreds of thousands. printers, with a price point of less than $100,000. 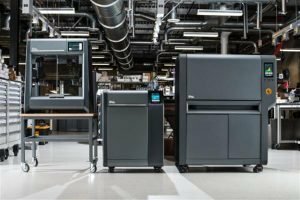 Similarly, Desktop Metal began shipping its Studio System, designed to print complex metal parts in-house, at the end of last year. Using the company’s proprietary Bound Metal Deposition (BMD) technology, rods of bound metal are extruded in a manner similar to FDM. The system, which includes the printer, debinder and sintering furnace, is reportedly up to 10 times cheaper than other comparable metal 3D printing technology. With these advances, and new players seeking to enter the metal 3D printing market, 2018 will see further improvements for metal 3D printing, such as material costs and build speeds. As this occurs, we will see more applications of metal AM, not only for creating functional prototypes, but also in the production of customised, complex end parts. Gone are the days when plastics were the only material conceivable for 3D printing. Today, there is already a wide range of materials available on the market, with progress already being made in the development of new materials, such as silicone and ceramics. Last year, chemical giant BASF made its foray into the 3D printing industry, with a series of partnerships focusing on 3D printing materials. 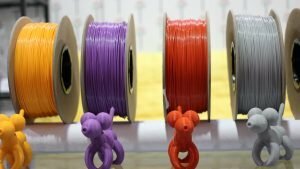 The emergence of new players in the market promise much excitement for the future of 3D printing materials. What new materials will we see in 2018? Will multi-material printers become more commonplace? What is clear is that material innovation – that is the development of materials that are adapted to the requirements of specific applications and which have a range of properties, such as thermal resistance, flexibility and rigidity – is needed to drive the industry forward. One of the major barriers to 3D printing becoming more commercial has been both the high costs and slow speeds of the technology. However, 3D printing has come leaps and bounds since its inception in the 1980s – and machine speeds have become ever faster. What does this mean for companies? Well, faster turnaround times mean shorter production cycles as the time to produce prototypes and parts are significantly reduce. This will make the value proposition of adopting AM technology appealing to many more businesses this year. The 3D printing industry is projected to be worth $32.78 billion by 2023. With an CAGR of 25.76%, this forecast indicates a very positive future for the industry. However, we are currently still very much at the tip of the iceberg in terms of understanding the full potential of 3D printing – not only for industrial applications, but also for the commercial consumer market. Businesses will need to invest in developing the skill set required to fully utilise 3D printing technology, and this, of course, will not happen overnight. However, while it will take some time for this transition to become fully apparent, 2018 will continue the road towards the integration of additive manufacturing into production workflows, helping to transform production processes and bring about the digital factory of the future.